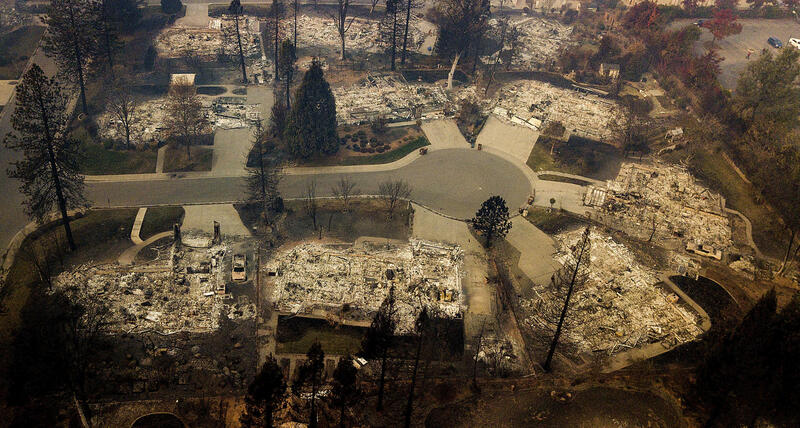 Residences leveled by the Camp Fire line a cul-de-sac in Paradise, Calif., on Thursday, Nov. 15. Some vitally important news on deadlines. FEMA, the Federal Emergency Management Agency announced today that it has extended its deadline for applying for disaster aid to February 15th. The registration period was scheduled to close today. The deadline for applying for disaster relief from the US Small Business Administration was also extended to February 15th. The deadline for signing up for the state’s free debris removal program was also extended to February 15th. The mandatory “right of entry” forms must be dropped off either the disaster recovery center in Paradise or Chico, or the Right of Entry center on Mira Loma Drive in Oroville. County spokeswoman Casey Hatcher said sign-ups have lagged for several reasons, including residents not understanding the program, being outside the area and still processing their emotional and property losses. Another critical deadline, for shuttering the Red Cross operated evacuee shelter at the Silver Dollar Fairgrounds in Chico also scheduled for today. County social workers have been desperately looking for accommodations for those remaining. Today, Red Cross officials announced that the lease on the fairgrounds was extended to March 15th and downplayed the significance of today’s deadline. “It’s a target date, essentially, so what we’re doing is meeting with all the clients that are here, the caseworkers are, to see if they have a plan, and the guarantee is when they leave they have a plan. A recovery plan. Whether that’s a place to live, y’know that kind of thing whatever, whatever their needs are, we want to make sure that their needs are met.” said Red Cross spokesman Steven Walsh. Walsh said the Fairgrounds has offered to lease parking spaces without hookups to trailer owners at a rate of $40 dollars a day. That works out to $1,200 a month. It’s unclear how many will be staying put and under exactly what conditions. Those staying at the shelter have been required to meet with caseworkers at least every two days. It is clear progress has been made. There were many fewer people on hand than a week ago. The dozens of trailers filling a large open field has dwindled to barely a handful in the final hours before the supposed closure. Among those remaining ahead of a looming deadline, uncertainty remained, with few good options. Some residents spoke of overly aggressive security, while others praised checkpoints and other tactics used to keep the peace and weed out troublemakers. Others described punitive punishments and the permanent ejection of evacuees over minor infractions. One claimed Red Cross workers were stealing from victims. Evacuees also said they were prohibited from interacting with protesters who demonstrated against the planned closure in recent days. A second demonstration was scheduled for earlier this afternoon. Anna Goodnight, who lost her Paradise home said by and large evacuees haven’t been treated with respect, and in some cases, face hostility. Seated next to her, Goodnight’s sister said the security was overzealous beyond reason.